Chapter 11 – Nation and Race – will be presented in three parts. Again, I summarize the contents using selections that best convey an understanding of Adolf Hitler's writing in the mid-1920's. Right off the bat we notice that the law of keeping with one's own kind is not being followed even in today's Alt-Right movement. No wonder those leaders and followers turn away from Hitler as "too extreme" and "not a realistic model." Under this thinking, we are experiencing the consequences of insulting Nature - as Hitler writes below - of distress, misery, and disease. P 527 Walking around in the garden of nature, most men have the conceit to think that they know everything. Yet almost all are blind to one of the outstanding principles that Nature employs in her work: the inner separation of the species of all living beings on Earth. Even a superficial glance shows that nature follows a rigid basic law in which all lifeforms are restricted to definite limits when propagating and multiplying their own kind. Each animal mates only with one of its own species. […] Deviations from this law take place only in exceptional circumstances. Interior Minister Horst Seehofer (right) listens as his intel chief Hans-Georg Maassen speaks. Maassen turned in a report on Friday explaining his position on a controversial video used by Chancellor Merkel and the left parties to denounce "nazi violence" in the city of Chemnitz during the past two weeks. UPDATE 9-12: Maassen survives grilling in Parliament; given vote of confidence by Interior Minister Seehofer. Maassen came under fire for not being tough enough against the so-called far-right during the anti-migration protests in the eastern German city of Chemnitz. At the hearing, the head of the domestic intellegence agency is reported to have aimed his criticism at the media, stating that terms like "hounding" should not be used lightly in writing because they can redefine reality. Seehofer praised Maassen for his work and stated that he had argued convincingly and with nuance. Naturally, the left and far-left were not satisfied, saying they had lost confidence in him. 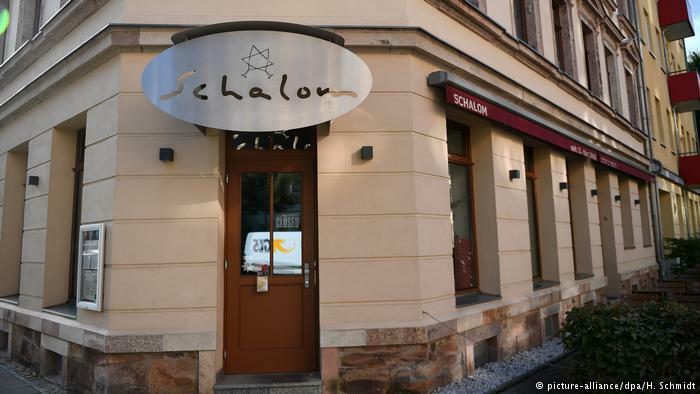 This restaurant in Chemnitz, Saxony claims it was attacked by masked antisemites armed with rocks and bottles during the "riots" on August 27. It was first reported on Sept. 2 by Die Welt. IN THE U.S., WE HAVE THE WASHINGTON POST'S BOB WOODWARD GOSSIP-BASED book on Donald Trump, along with an anonymous, very similar sounding letter published in the NYTimes, both seeking to destabilize the President and his administration. Would you say that the establishment media and the Democrat Party are one and the same? I would say that. “Does the so-called ‘Senior Administration Official’ really exist, or is it just the Failing New York Times with another phony source?" asks the President in a tweet today. That is the right question to ask. SORRY, BUT i JUST CAN'T BELIEVE THAT A REAL REPUBLICAN – even a RINO – who actually went to work for the Trump White House and who wants the President to succeed, would think that publicizing such a letter would be helpful to that goal. This letter is clearly intended to deepen the impression made by the Bob Woodward book of fiction that's just come out, and to keep up as many distractions as possible from Trump's positive accomplishments before the midterm elections in November. Among the thousands who demonstrated in Chemnitz last week, some carried this very explicit sign. No message could be more deplorable to the majority parties. UPDATE 9/7 - Well, golly gee. Germany's top federal domestic security chief, Hans-Georg Maassen, President of the Federal Office for the Protection of the Constitution, has stated that reports that right-wing "extremists" were chasing down non-Germans during demonstrations in Chemnitz cannot be verified. "I share the scepticism towards media reports of right-wing extremists chasing down [foreigners] in Chemnitz," Hans-Georg Maaßen told Bild. A video that was shared online claimed to show far-right protesters chasing after people who looked non-German. Maaßen said: "There is no evidence to suggest that the video of this alleged incident circulating online is authentic." The sign at the entrance to the Kiryas Joel community, prior to its becoming the independent town of Palm Tree, warns visitors not to offend the sensibilities of the residents by exposing bare arms and legs. REMEMBER KIRYAS JOEL? I WROTE about it last November. It has the distinction of being the first Jewish town in the United States. This Hasidic community of over 20,000 Yiddish speakers had been a thorn in the side of the city of Monroe, NY – so much so that the voters in Monroe finally approved a measure to allow the Satmar sect to secede and become the state's first new town in 35 years. The town of Palm Tree (English translation of Teitelbaum, the surname of the rabbi who first settled in the area with a few Jews in the mid-1970's ) will come into official existence in 2020 with 214 acres of Monroe land and its own school system.